There are endless fan covers of Zelda music on YouTube alone, and a good portion of them show off the awesome talent of the creator. Mart0zz and his friends have arranged another cover on the marimba (with other assorted instruments), this one being the Dark World music from A Link to the Past. 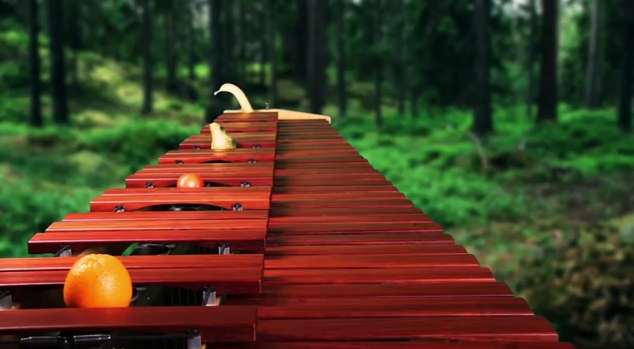 The fruit on the marimba and the forest setting in the background give it a nice touch, even if I doubt that they’re in an actual forest. It does give the music a forest-y feel though. Listening to other people play awesome music like this makes me want to get to work on my ocarina! If you’re interested, make the jump to watch the video below. How do you like the cover? What about the forest setting? Any other songs you’d like to hear them play? Feel free to tell us in the comments.